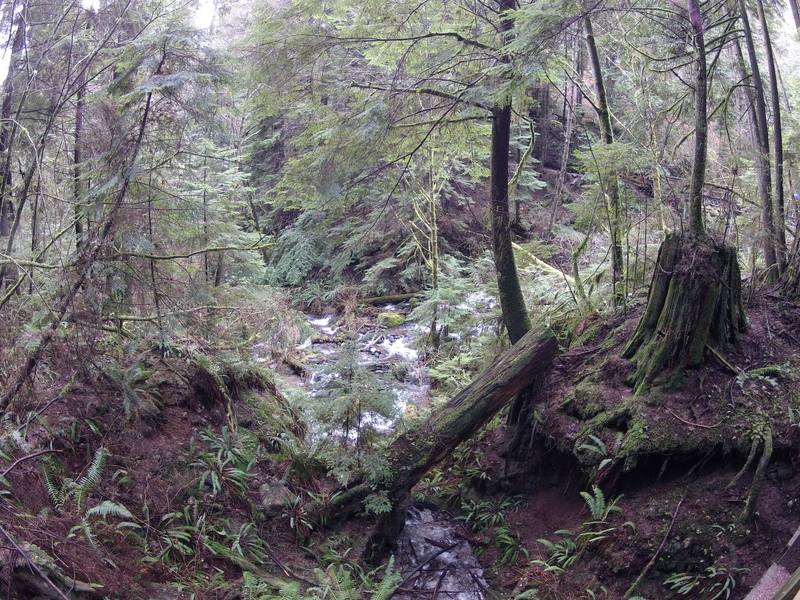 Above the steep rocky canyon and raging rapids of Capliano River, once stood an impressive forest of towering Douglas-firs and Western red-cedars containing specimens reputed to be 6m in diameter. The majority of the Lower Capilano’s ancient forests were logged in the early 1900’s but a few impressive groves remain. 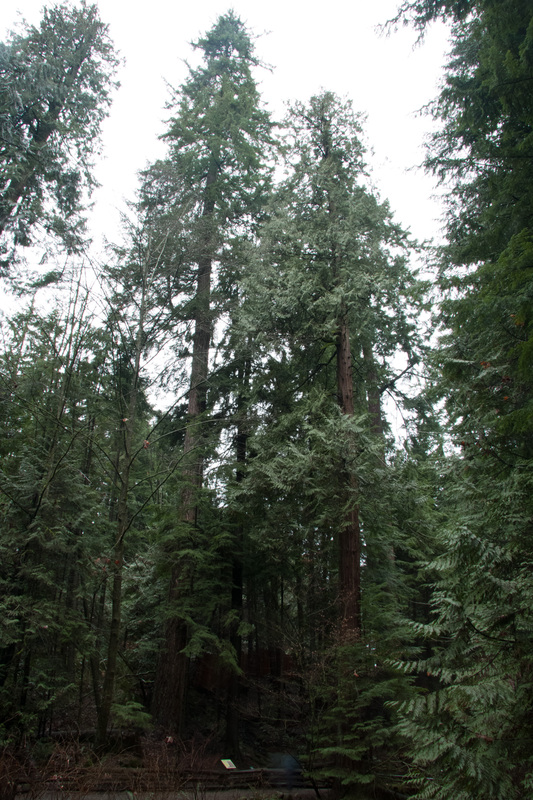 The old-growth remaining within the Capilano Suspension Bridge Park was left because it was privately owned land. A few monumental Douglas-firs are left scattered farther up the valley perhaps because they were too old, gnarled and not worth the labourous task of logging (Stoltmann 1987). Logging in the Upper Capilano Reservoir in the 1920’s with the Lions seen behind. In 1905, the Capilano watershed was made off limits to logging to protect Vancouver’s vital drinking water supply. However, private lands continued to be logged. All logging was banned by 1931 to protect water supplies until, incomprehensibly, in 1967 systematic industrial logging returned and removed nearly all low elevation old-growth. Removal of the forests impacted the city’s water quality and was finally banned around 1999 following decades of public outcry motivated by concern of the impacts of logging on the vital water supply for over 2 million people (read about it here). The logging that occurred in these forests was done long before chainsaws were introduced to the woods in the 1950s and railways were not yet commonplace for log transport. 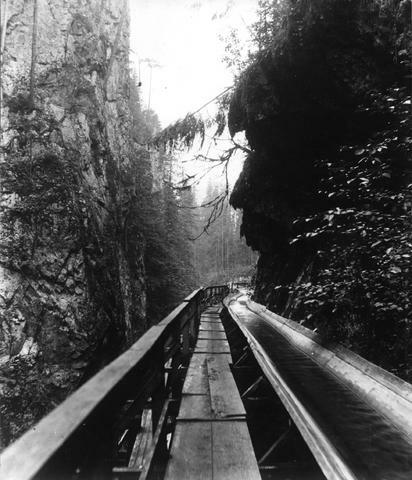 Trees were felled by axe and cross-cut saw before being moved by primitive means such as by a stilted wooden flume that traversed the length of the steep and inaccessible Capilano canyon (See photo below). Some brave (or crazy) men rode the flumes themselves down to the shore. Time: 1 hour- to half day. The area is small but there are numerous activities to partake in. The Capilano Suspension Bridge Park in North Vancouver has been a privately owned tourism facility since as early as 1911 and now attracts over 800,000 visitors a year. Considering that each now pays between $12 (kids) and $33 (adults) to enter, this is probably the province’s most valuable old-growth forests and is a concrete example of economical use alternative to logging. In addition to the direct revenue gained, the site is now one of Vancouver’s most publicized tourist attractions and thus contributes to the city’s reputation as a top tourism destination. The park contains many old-growth Douglas-firs (Psuedotsuga menziesii) over 60m tall that are connected by an impressive “Ewok-style” canopy walkway that allows visitors to walk amongst the canopies of these great trees nearly 100 feet above the ground. The canopy walkway, suspension bridge and cliff walk combined with interpretive signs throughout makes the area an exciting and highly convenient place to see large trees. However, some of the parks interpretation may be incorrect. For example, they claim that some trees are 1,300 years old, which appears to be an overestimation. Also, the suspension bridge is incorrectly advertised as being 70 meters high, when in fact it is 49m high (Stoltmann 1987). The area makes a nice visit for prepared hikers during winter months when crowds are low. To avoid big crowds on the weekends and too see larger trees for free, consider exploring the public forests of Capilano River Regional Park immediately to the north (below). Difficulty: easy-moderate. It is recommended to bring a trail map for this hike. Weather: suggested in all weather. I enjoy it in the mist as it adds to the beauty of this inherently humid forest. If arriving by car I suggest approaching via Capilano Park Road and parking at the salmon hatchery. One of the big tree highlights is at the beginning. A Douglas fir towers above the north side of the parking area. This Douglas-fir is not so thick at 1.8 m but an impressive height of 76.5m making it the tallest tree in Vancouver that can be easily viewed from a road. From the parking lot walk towards the river, past a relatively large, slanted Pacific yew (Taxus brevifolia) growing beside the trash barrels. Note its flaky, reddish bark, which contains a chemical called taxol that is used to create one of the most effective cancer treatement medicines known. The discovery of this chemical in the 1980s led to widespread over harvesting of yew bark and resulted in the otherwise common native tree becoming rare in many of the forests it occurs throughout BC. 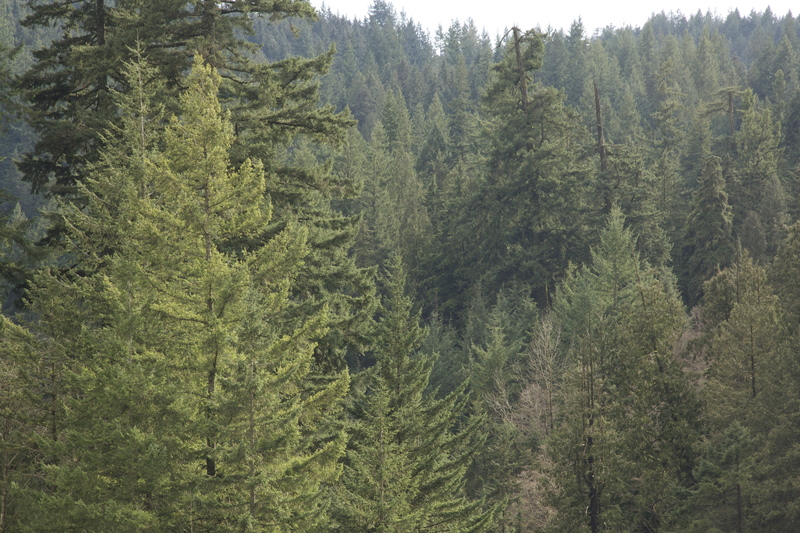 The largest recorded Pacific yews in BC, discovered by local big tree searcher Ralf Kelman, are all located nearby in the Capilano valley watershed area where no public access is permitted. From the parking and salmon hatchery area follow the riverside trail downstream, immediately crossing a bridge over the Capilano River, then turn right and follow the river upstream until arriving at the “Second-Canyon Viewpoint,” which is a dead end. 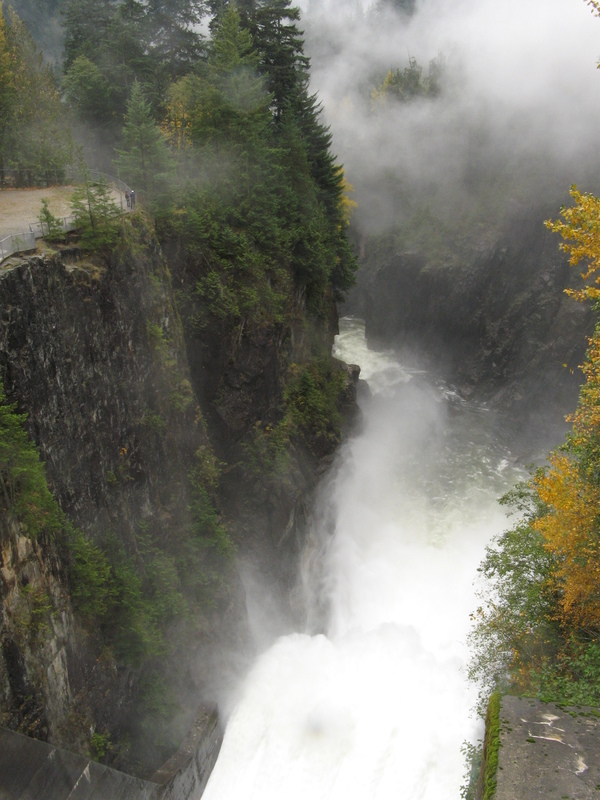 Here you have an impressive view of the canyon and the dam, which forms the Capilano Water Reservoir. Turn around, taking your first right which does a short ascending traverse, then flattens out where two large Douglas-firs are growing with a small wooden fence around them. These trees, one 1.8m DBH and the other 2.3m DBH, are legacies of the previous forest, and were perhaps not cut because they were considered to gnarled and rotten to be worthwhile for the laborious task of cutting and hauling them to coastal mills (Stoltmann 1987). An alternative likely explanation is that many old Douglas-firs left scattered in otherwise clear-cut forests around Vancouver were spared because loggers were primarily harvesting cedar, which was at times highly valued as an export commodity in the early 1900’s. Continue past these old trees and hang a right at the next junction, being sure you are following the ‘Giant fir’ trail. Soon you will arrive at the area’s most impressive tree: Grandpa Capilano (see video). This giant is 2.4 meters in diameter, though, its ancient crown has been damaged by wind over the centuries and is no longer so tall. From here you could follow your footsteps back but if you have time and energy I recommend extending your hike into a simple loop. So if you like, continue along this trail then turn right at the wide Capilano Pacific Trail, which ascends upwards to cross Cleveland dam. The dam offers an awesome birdseye view of the Capilano Canyon to the right and an inspiring view of the Capilano Reservoir to the left. 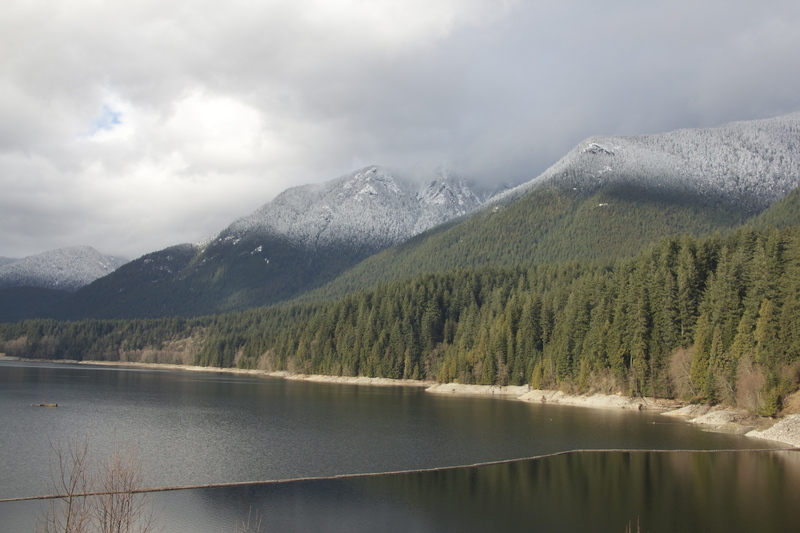 The reservoir supplies about 1/3 of Greater Vancouver’s water supply. Despite its role in supplying clean water to some 2.3 million people, the city’s watersheds have an unfortunate history of clear-cut logging, which reflects the historic, and more or less continued, tendency for resource managers to discount many of the values of forests and to concentrate on optimizing the forest’s most immediately merchantable value (ie. timber). For a great account of the history of logging in Vancouver’s watersheds visit here: http://www.bctwa.org/AboutGreaterVanWatersheds.pdf Or visit Metro Vancouver’s site here to learn more about the watersheds and sign up for free tours offered July-September. After crossing the dam head to the right of the restrooms towards the top of the ‘Palisades’ trail, which then veers downhill back to the Salmon Hatchery and ‘Capilano Park Road’ parking area. This also serves as a convenient place to start the hike, especially if arriving by bus. This trail winds downwards through pleasant, mostly old-growth forest. There are no spectacular trees, just pleasant scenery and tall trees. Take a deep breath or sit for a while before rushing back to the city. For future hikes in the area, I recommend exploring any combination of the trails in the park as they are all quite beautiful, usually passing large trees and always bringing hikers through peaceful and somewhat primitive feeling rainforest scenes. 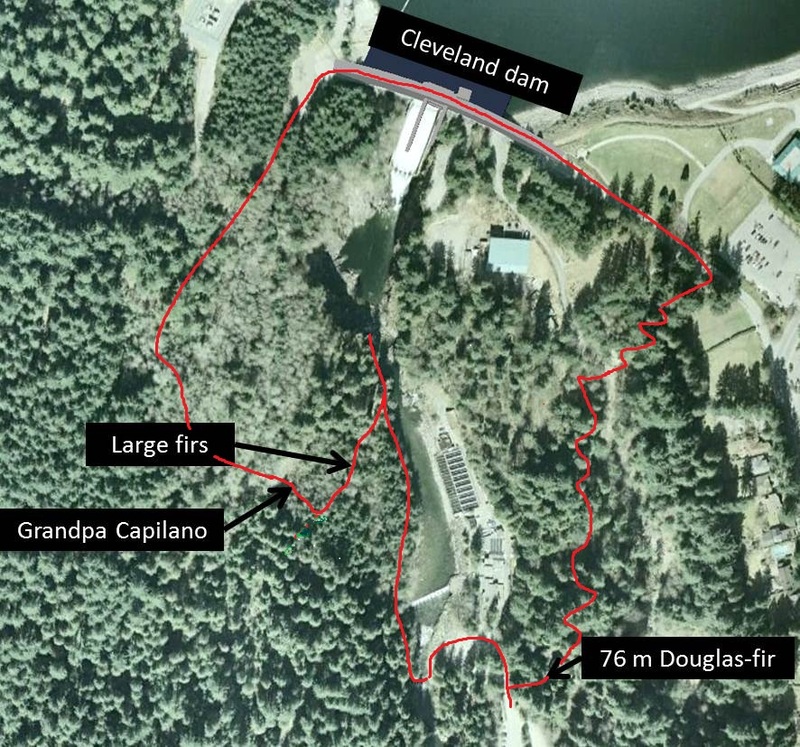 For a much longer, more adventurous hike start at the mouth of Capilano River near park Royal and follow the ‘Capilano Pacific Trail’ all the way to Cleveland Dam (7.5km). Following this trail from the sea involves some route finding around portions of the trail damaged by floods and pases through some urban areas. But its not too difficult and the trail provides a good viewing of the big trees of Capilano Suspension Bridge Park without paying to enter. Then detour to the big Douglas-firs mentioned above (in part 3) along the the ‘Giant fir’ trail. Hikes such as these are splendid Vancouver experiences in that they start at the sea, pass old-growth temperate rainforest and then arrive in the mountaintops. They are also highly sustainable options to enjoying the great outdoors in that they do not require much fossil fuel-powered transport to and from the trailheads. They can be accomplished using bicycle, public transport, hitchhiking or short drives. Since the days of John Muir it has been recognized that enjoyment of outdoor experiences can be enhanced greatly by travelling with ethics intended to create harmony between the hiker and the forest. In recognition of the current condition of the global environment and the threat of climate change to our legacy forests this requires going beyond the traditional “leave no trace” wilderness ethic and extends it to a broader “create minimal ecological footprint,” wilderness philosophy. Such a gem so close to downtown Vancouver. 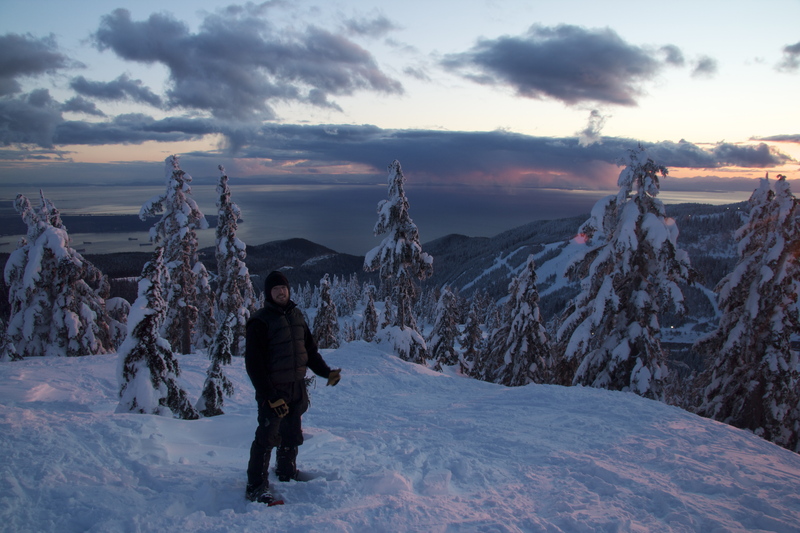 That’s quite the hike from mouth of Cap to Hollyburn Peak (great photo)!